I've been racking my brain for a storage solution for my youngest's bedroom and played with the idea of creating a custom shelving system. But then... I found a set of old metal gym lockers and I thought, "Nah.. this would be more fun." :) Another plus? 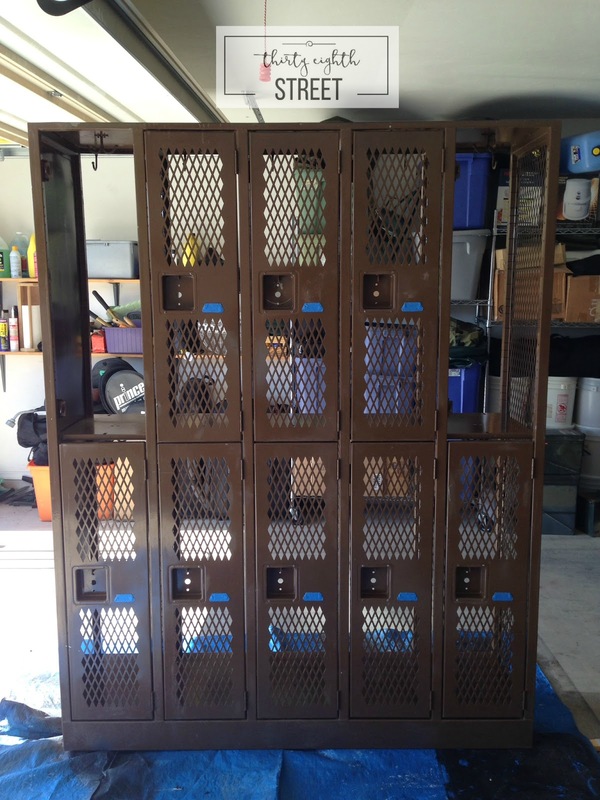 Metal lockers are slim so they offer quite a bit of vertical storage space without sticking out. 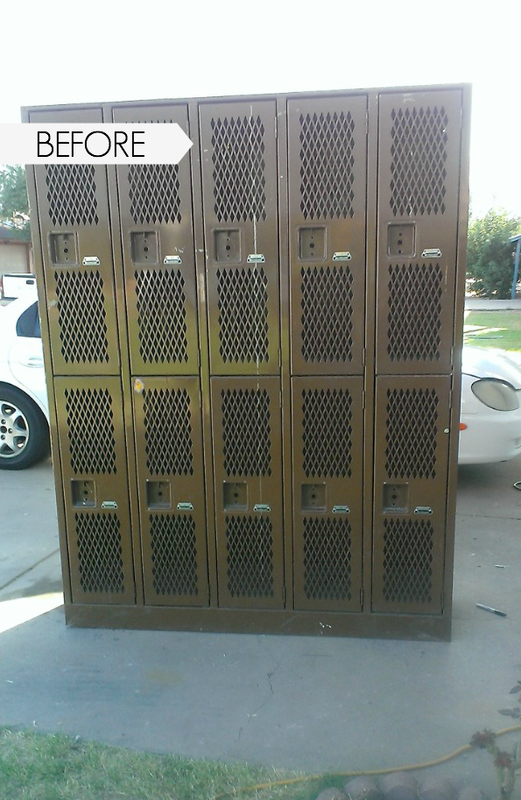 Painting and repurposing old metal lockers is a great way to create an industrial look for a small space! It doesn't show in this picture, but the lockers came with the original dial combination locking mechanisms. These were salvaged from a high school gym remodeling project. Those high school girls were so good to me. I only had an "I love John. ", one gum wad, and a few stickers to contend with. These were in such great shape, I couldn't believe it. (Some of the links below are affiliate links for your shopping convenience. I started the makeover process by wiping it down with a mixture of bleach and water (directions on bleach bottle) and a good scrub brush. When they were dry, we customized the lockers by taking the backing off and top two doors off. This was a personal styling preference. I liked how open and airy it made the unit feel. Tape off your locker numbers or any hardware that you don't want painted. 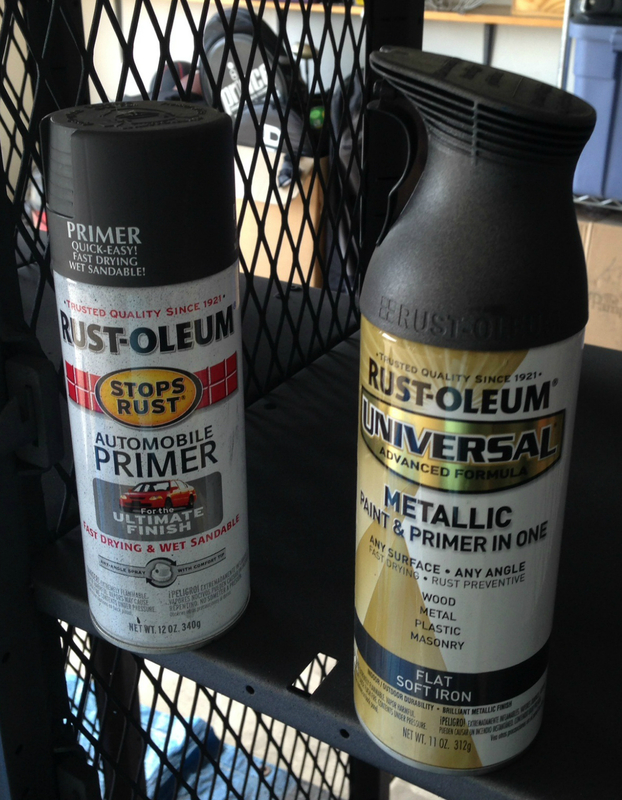 we went over those same spaces with Rust-Oleum Metallic Paint & Primer in One. Annie Sloan's Dark and Clear Wax was used to create a muddy and worn look. We unscrewed the back of the locking mechanism so that my guy could still have the look of the vintage locks without actually having to unlock each locker. This was a simple weekend project that took minimal effort and money but gave an incredible fun return. And of course the cherry on top was watching his face light up when I showed him this! We are in cleaning mode at our house and having a brand new place to store books, toys and "stuff" brought out an, "I promise I'm gonna keep my room really clean, Mom!" Visit our DIY Rustic Desks for another spacer saver idea! Or check out our idea for Displaying Your Child's Art in Style! Happy Organizing & Happy Fall to you! Gorgeous and it's a really nice touch taking the doors off in some places. I've been looking for a locker every where in South Africa and can't find one anywhere. It's not something that you see here. Oh well I'm going to pin this and carry on looking. Thanks for the share. What a great project! 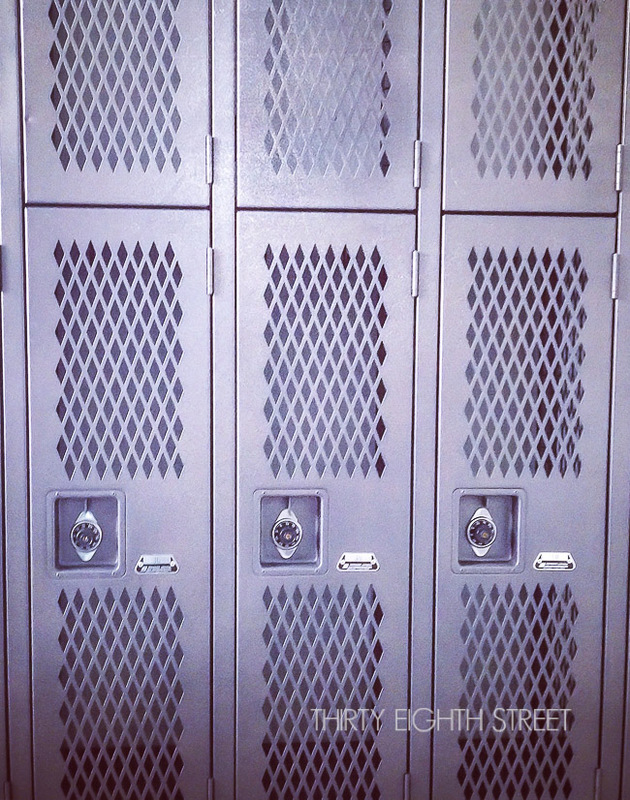 The lockers look wonderful and they are so functional. Pinned and tweeted. Thanks for sharing at Snickerdoodle Sunday! We have enjoyed these lockers. :) Thanks so much for sharing them! Have a great week, Beverly! I love this! It would be cool for a kids bedroom, or a mudroom, in almost any house. It would be so cool and would match our style. I bet your son loves it! And it's so cool that you put the locks back on, it adds so much to the style! Love it. My son's eyes lit up when he saw it. It's a fun piece! Thanks for linking up with Welcome Home Wednesdays! Ah! I am in love with this! Such a wonderful find, I need to be on the lookout now for some lockers. You did a beautiful job upcycling it into an awesome storage piece. Pinning! I hope you find some! :) Thank you for sharing! 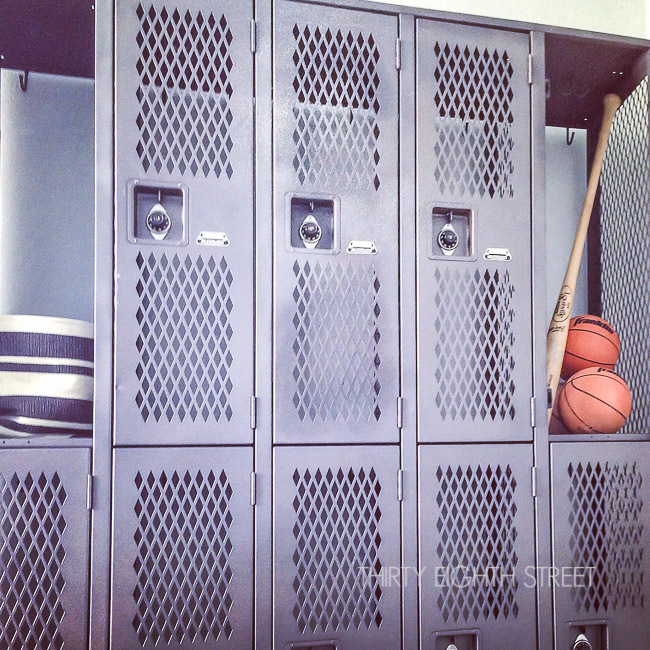 You gave those lockers a fabulous makeover! They look so great, and I love that you removed some of the doors. Thanks so much for sharing at Vintage Charm. It's great you gave old lockers new life. I am sure your son will enjoy them for many years to come. You did a beautiful job painting them! Finds like this don't come around very often, congrats! It's true! Depending on what area you live they can be tough to find! Ok we are going to give you the cool mom award right now! I think any kid would want this in their room, it is fun and functional! Thank you for providing us with some Sweet Inspiration, albeit of the industrial kind. I'm laughing! I'm going to add "cool mom" to my resume. :) Thanks for making my day, Mary! What a find! I am sure your son loves this look and the storage space in his room! I think every Mom wishes that they could find a great solution for their kids' rooms! They look great! Thanks so much for sharing at the Celebrate Your Story! link party. What a beautiful makeover! 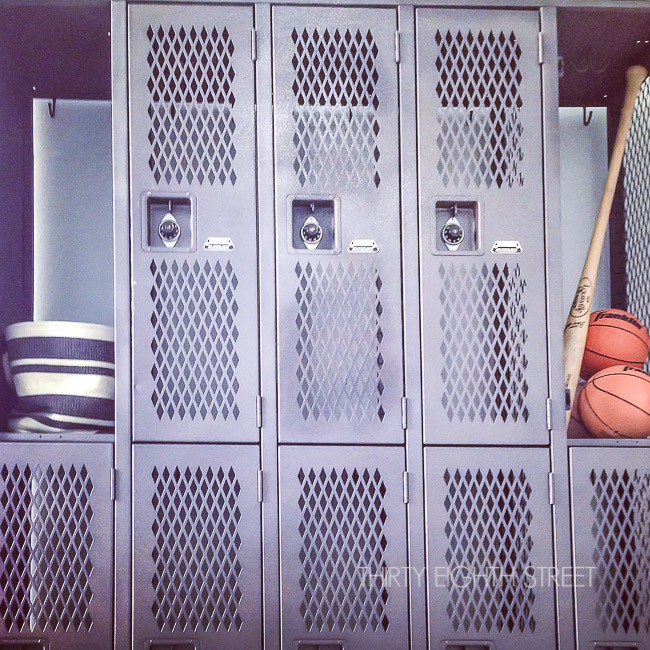 I just love lockers, don't you? Yes! Functional and they have personality! ;) Thanks, Meegan!